Showmethecoupon.com offers you a great opportunity during this Easter. Along with comparing prices and rating products, our site helps consumers to find the best available offers from thousands of online stores. As working directly with retailers and affiliate networks, we are glad to bring you the best online deals, coupon codes or discounts, hoping to save your valuable time and money. Easter is coming, and in the spirit of the holiday, we’re giving away an amazing prize to one lucky winner. This is a quick and easy giveaway with only a few entries! If you won, you will be notified within a couple hours! All you have to do is enter below! Good luck & Happy Easter. 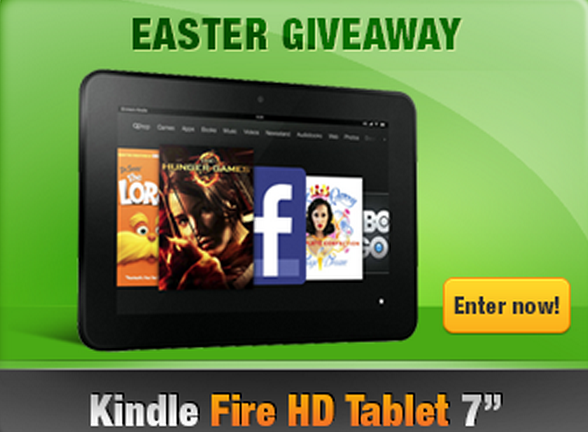 Showmethecoupon is giving away a Kindle Fire HD Tablet (value $199). The deadline to enter is March 31 at 11:59:59 p.m. Eastern Time. The prize will be awarded to person whom can earn the highest point along with the most correct answers. Points can be earned daily by finishing tasks in this giveaway. Share this giveaway on Facebook or Twitter. - Answer 3 quick questions about Easter. Also, be sure to visit the Showmethecoupon.com for daily chances to win more great prizes! We'll show you a new tutorial every day, so visit often! While you're there, help us celebrate Easter by selecting a wide range of daily updated coupons. We are also glad to announce that we delivered the $100 gift card to the winner of the St. Patrick's Day giveaway, Colleen Boudreau, as we promised. So keep in mind that there would be no cheats or frauds here. Thank you for your attention.